Provenance: The Bikanēr armory, Bikanēr. 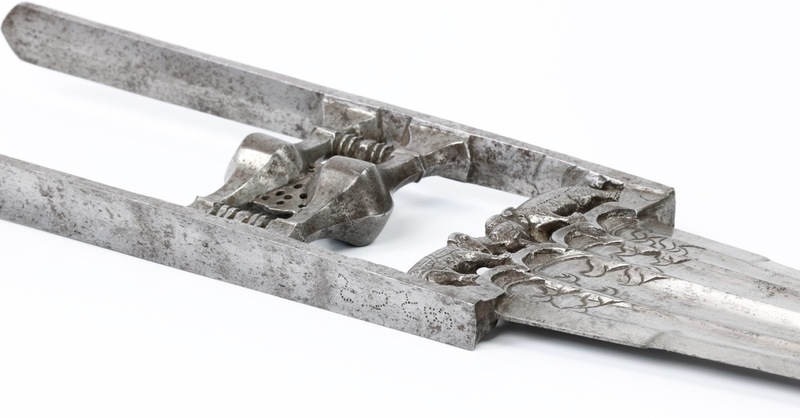 An interesting katar from Rajasthan. 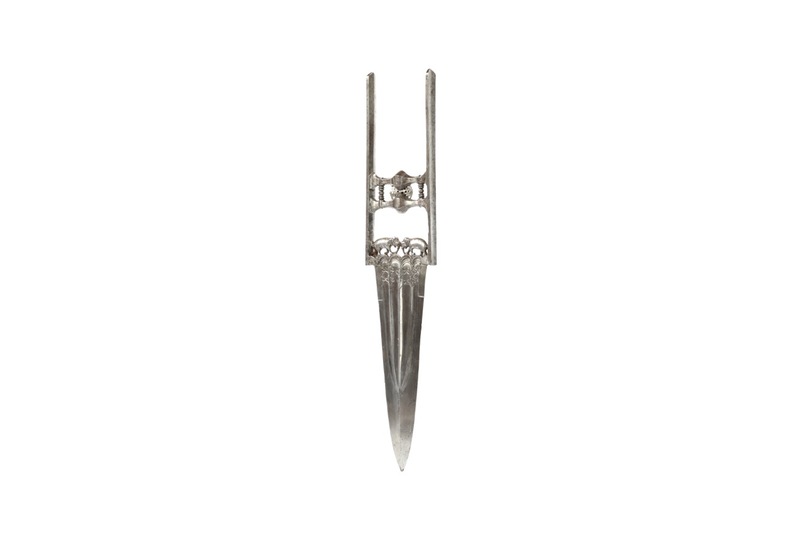 It has a wide blade with four grooves running side-by side and terminating into a single point on the center ridge line of the blade. 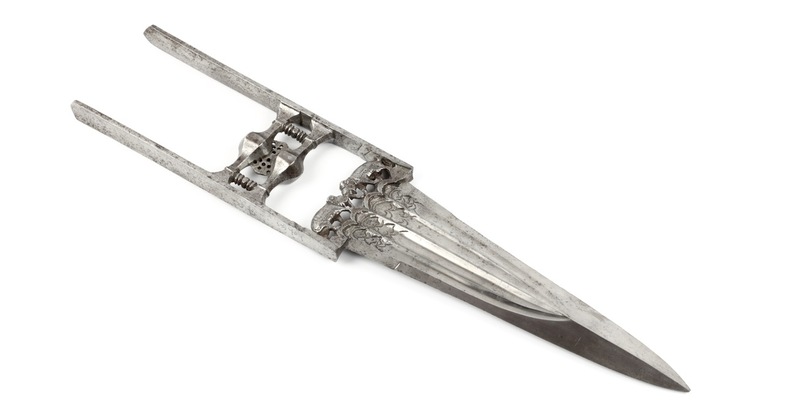 There are four archers at the base of the blade with decorative engravings at the base of each groove. 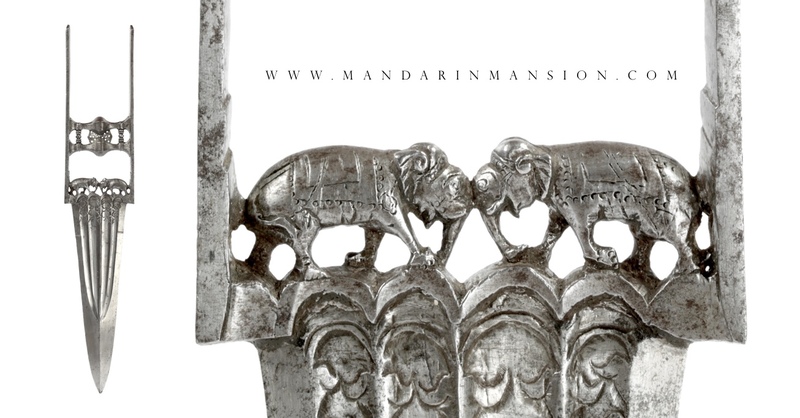 The most striking feature of this piece are the two facing elephants on top of the base of the blade, chiseled three dimensionally. The hilt consists of two side-bars, hollow ground on the outside while the inside has two facets, with a well-defined center ridge line dividing them. 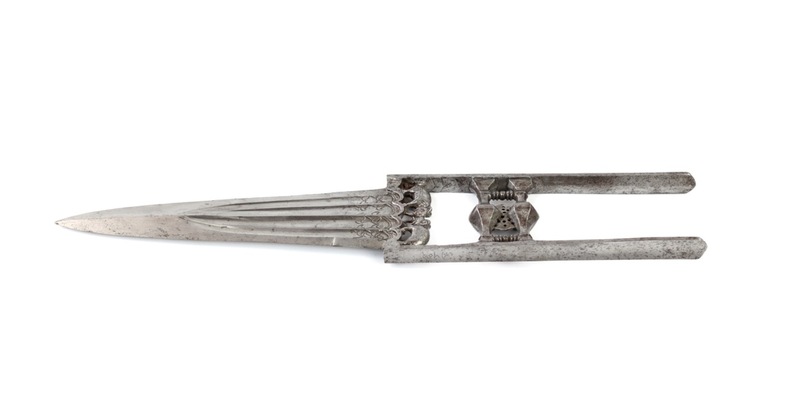 The handle consists of two bars of hexagonal cross-section with a prominent thickening in the center, connected by a pierced plate and a chiseled rod on either side. 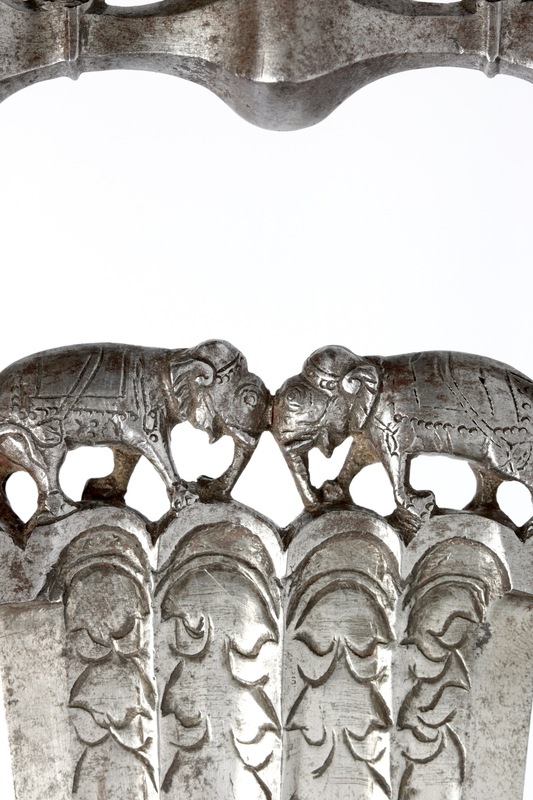 The elephants may be a reference to a rather similarly positioned pair of elephants adorning the gate of Bundi palace. 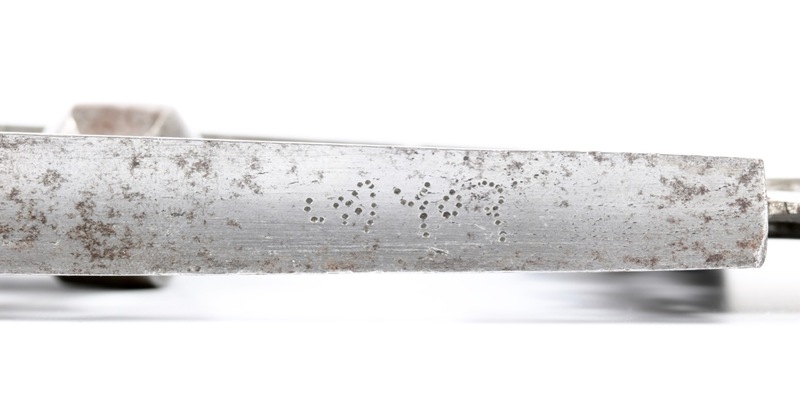 Bikaner punched dot marking "Bhi 282"
Bikaner punched dot marking "Bhi 502"
Not all items with Bikaner markings are from Bikaner itself, and although this katar has all the hallmarks of Rajasthani manufacture, it may have been made elsewhere. 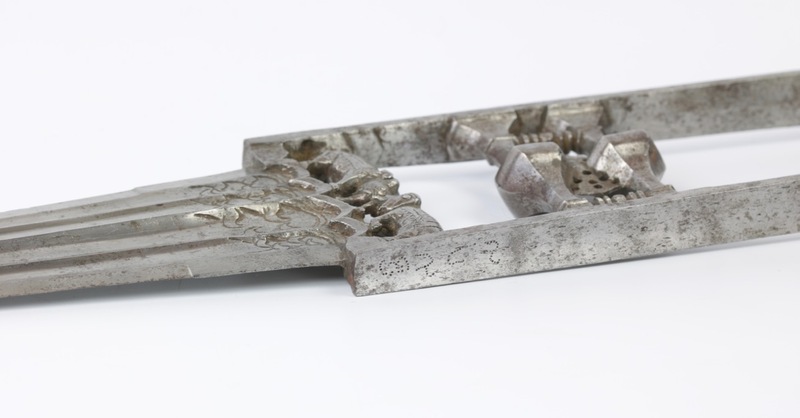 A hint to possible origins is provided by two katar presented to the Prince of Wales, who was later to become King Edward VII of the United Kingdom, during his visit to India in 1875. 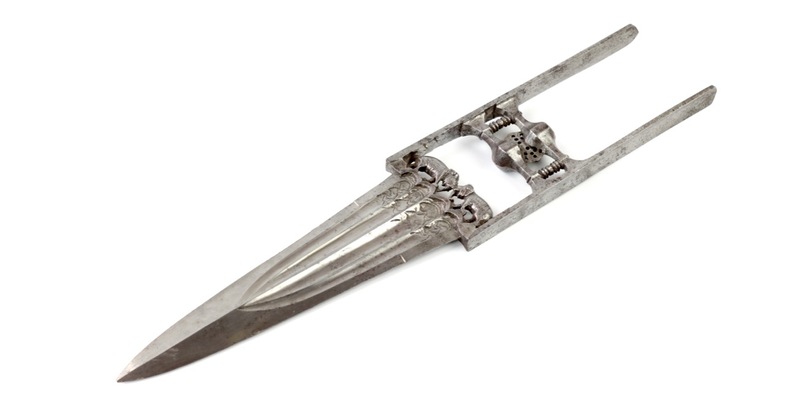 Both with a blade with multiple grooves emerging from a scalloped base, and both with these very characteristic handle bars. One was recorded as presented by Jaisinhji Bhupatsinhji, Thakur Sahib of Dhrol, the other by His Heighness the Rao of Cutch. Dhrol and Kutch are both located in Gujarat, about 100km apart. Although these gifts did not always represent purely local styles, I deem it unlikely that both dignitaries would independently present something similar that was not from their own region. 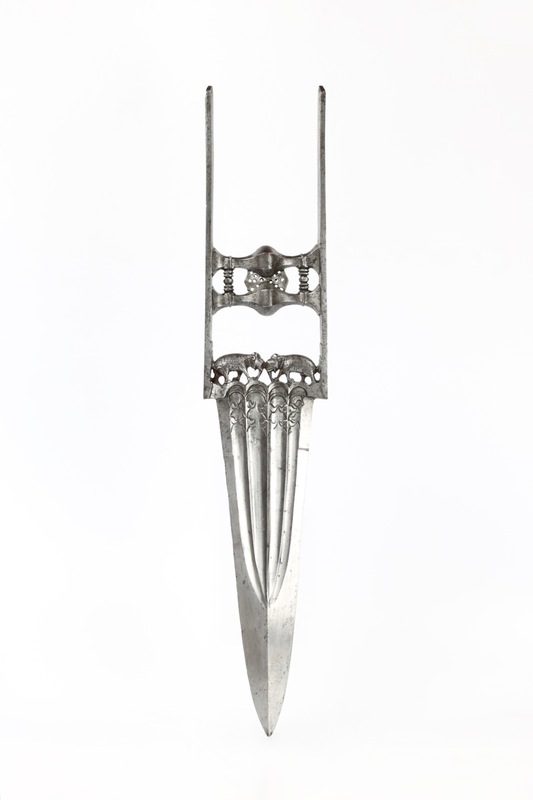 See the Dhrol example, Royal Collection inventory number 11343. 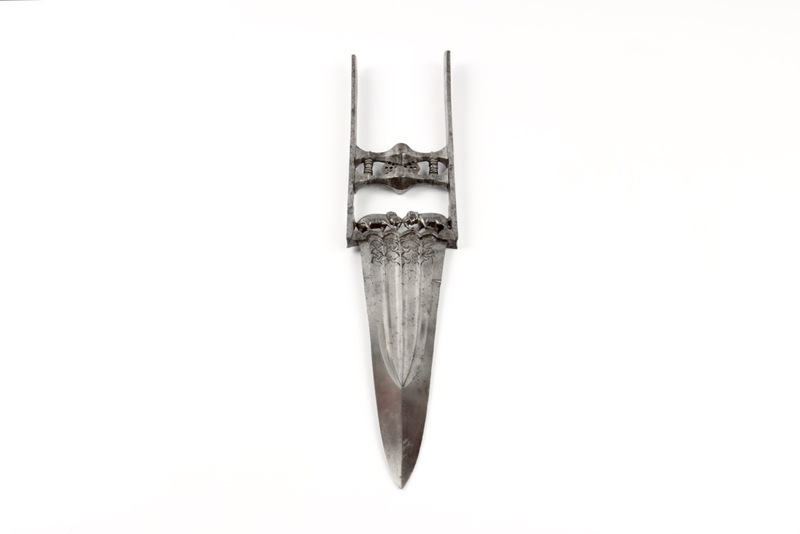 For the Kutch example, see: Royal Collection inventory number 11345. 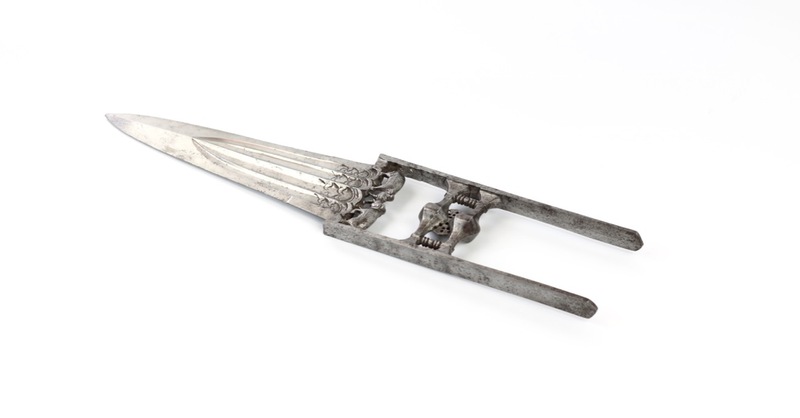 A nice all-steel north Indian katar, probably made in Gujarat and eventually incorporated in the Bikaner armory. 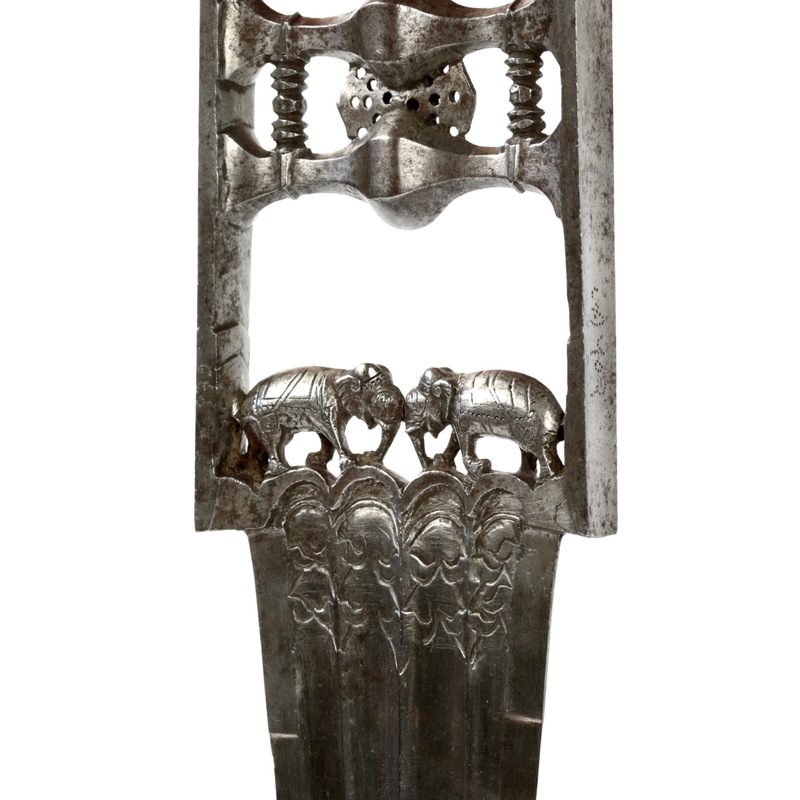 Most striking are the opposing pair of elephants chiseled on top of the blade's base, a rather unusual feature.